A site dedicated to helping you become stronger across the board; physically, mentally and emotionally. Foam Rolling: Yes? No? How? Why? Apparently there are 4.54 billion pages in existence on the internet and I’d argue a fair percentage of that number is posts on whether or not you should foam roll. Some of them are flat out saying foam rolling is useless for everyone and it should be avoided. End of article then? Wait a sec! Let me ask you: can we really say something is bad for everyone despite there being thousands…….maybe millions of people benefiting from it, or having benefited from it? When did you last hear of someone dying from foam rolling? It may have happened but I can assure you it didn’t happen from faulty foam rolling – even if someone repeatedly smacked you around the head with one, I doubt you’d die. Too many commercial gyms have foam rollers that would be better suited as bed pillows. A foam roller SHOULDN’T be soft. The harder the foam roller, the greater pressure can be applied to your muscle tissues and fascia, and providing you’re foam rolling correctly, the greater the release. Once a foam roller loses its density and becomes ‘spongy’ it needs replacing. How many people have you seen rolling back and forth on a foam roller like they’re trying to get the roller to start up or something? I hate to break it you but the faster you go, the LESS likely you are to hit a trigger point; this trigger point is basically the tight/tender spot in the muscle that needs to be relaxed. If you’re wizzing past it quickly, how can the muscle ever get a chance to relax? A better (and ideal) way to do it is to slowly roll over the entirety of the muscle until you find the said trigger point and then staying on the point of highest tension, breathing into it and spending a good 60 secs+ and you’ll find eventually it doesn’t feel so tender. You can’t foam roll a muscle if you don’t exactly know where the muscle is. It’s simple but often overlooked. Just having a decent knowledge on muscle location/function should be enough to ensure you don’t end up trying to foam roll your calves with the foam roller under your armpit. A fitness enthusiast will get a foam roller for Christmas and will want to play with it all day long – they’ll foam roll their fingers, their skull, their neck, their lower back, they’ll even get their dog foam rolling religiously every night. Come on now, less is more! If you’re correctly foam rolling and following the guidelines we’ve already established, and still not feeling anything, then that particular area probably doesn’t need to be foam rolled. Focus on areas in need and you’ll maximise your time and not have to spend ages on a foam roller for no benefit. I don’t know about you but I have got better things to do! Issue #5 – Good old consistency! Foam rolling once per month will never yield noticeable changes; would you expect to get ripped eating broccoli once per month but junk food for the other 30 days?! Consistency applies to almost everything in life but definitely everything fitness related. Foam rolling is least of all an exception! Frequent sessions on rest days are sufficient. Again, by following the ideas already mentioned you shouldn’t need to spend too long once you know which muscles are deserving of attention and which aren’t. 1-3 minutes spent on areas in need done 3 times per week is a frequency that should bring about good results in terms of tissue quality and mobility improvements. Your body will adapt to foam rolling like it adapts to anything else it’s exposed to enough. Once again, foam rolling is no exception. This means you’ll have to either foam roll for longer (not recommended) or foam roll with more intensity (i.e. more pressure/force). The simplest method to do this is to invest in a better foam roller. There are some really hard ones on the market which are much more effective than your run of the mill gym one or supermarket one. Also, anyone used to (good) sports massages or ART (Active Release Therapy) may be beyond the point of regular foam rolling. Basically a knowledgeable human will always outdo a foam tube. Maybe every once in a while a spot of foam rolling may help you feel a little looser but it’ll never be comparable to a skilled practitioner. Foam rolling doesn’t magically improve flexibility. I’ve seen people using foam rollers and wondering why they can’t go from not being able to touch their toes, to being able to kiss their knees in a standing forward fold. Foam rolling is a TEMPORARY release of the muscles, which then allows you to do any necessary mobility drills. Granted, foam rolling when done properly can slightly and momentarily improve flexibility but for faster gains you need to combine it with direct flexibility work. Other implements can be used for self myo-fascial release. Lacrosse balls are a good choice for massaging tender muscle tissues. It’s not unheard of to even use cricket balls or tennis balls as these have a small surface area, which allows for specific targeting. The pec minor seems to respond particularly well to cricket ball release – providing you locate the muscle correctly. This isn’t to say you can’t foam roll small muscles, but with the foam roller you’ll be foam rolling a larger area which makes finding the ‘sweet spot’ tougher. Hence why some folk prefer the ball option. 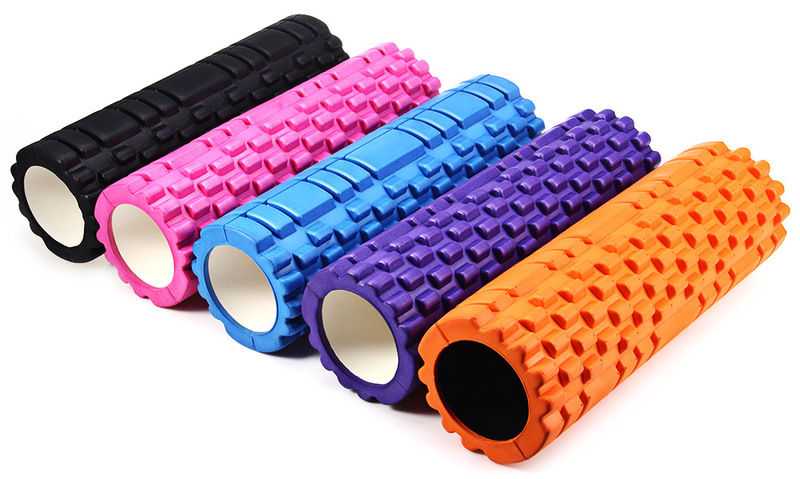 Foam rollers aren’t limited to merely massage purposes either; they can be used as blocks (like yoga blocks) or even just support implements. The ways which you can use them extend far beyond what the generic chart on the wall in your gym says. The 'brains' behind StraightTalkingFitness, a site all about discovery that leads to strength in all formats; fitness, mental, emotional and spiritual. Everything starts from within and projects outwards. Master the body, master anything and everything. Previous Previous post: What YOU NEED To Know About The Front Lever! Have to admit I’ve always looked at foam rolling kind of skeptically, but it makes sense to use it as a supplement to mobility practice, i.e. loosening stiff areas prior to compression/stretch work. Is that how you use it? I guess I always thought it was more of a therapeutic/rehab tool than warmup for mobility. One of my major mobility goals right now is a pancake (straddle with chest to the floor). Is there a target area you’d recommend foam rolling to assist with that work? Yes, that’s exactly what I’d use it for. It just loosens the tissues up. I use it an awful lot on my lats, teres minor and thoracic spine as I have poor overhead mobility. Foam rolling could definitely aid your pancake! Do you have any insights into what areas are restricting you in the pancake? It will either be hamstrings, adductors, hip compression or all 3! Probably all 3 😉 But I would guess it’s primarily adductors — that inner area of my thigh seems to be super tight in the pancake straddle, even moreso than the hammies. I’ll look into getting a decent roller and giving it a go. Out of curiosity how would you use a roller to assist with compression? I’d give the adductors a foam roll before you train your pancake. Find the tight spot and just hang out there, learnt to love the torture haha. Out of interest, how do you train your pancake? Is it with mainly static stretching, loaded stretching or anything else? Using a foam roller, and also utlizing a mobility program like romwod or mobility wod, would definately be a great plan. Great and thoughtful article. Foam rolling is often seen as a cureall or as snake oil. Is more about knowing how to use it and when to use it. Thanks for commenting! Foam rolling adds a slight edge, providing you even need it in the first place. You’re right, the fitness industry will have you believe anything is magic if you’re willing to pay for it. I’ve been trying to foam roll recently, and have no idea what I’m doing so this post was perfect for me! Thank you for sharing. My pleasure! Have you found it’s made any difference to your recovery or how you feel? Definitely! If you find an area agonizing to roll then it’s a sure sign you need to pay more attention to the area! The only thing I find is the more you get used to rolling, the more you need harder objects/even deep tissue massage. What areas do you find to be most painful? I just used a barbell to roll out my traps the other day. They feel 100xs better today. I could basically feel the knots! The hardest part is rolling out my calves! Mine are usually so tight that it is painful to roll them out after a run or double unders (jumping rope). A massage therapist I know said calves and pecs are the 2 most tender areas to work on, so it stands to reason you hate the calves! But as you know, this means you’ve got to work on them! nice! the blog post is very nice, tell me one thing, this foaming and rolling is helping in fixing the distorted fascia? because I have talked to my therapist she says that I am suffering from the distorted fascia. I’m not so sure the foam rolling is helping distorted fascia; it depends what you mean by ‘distorted’? Foam rolling will break up adhesions within the fascia though. My pleasure Sammie, yeah foam rolling is good but not long term at all. I do think foam rolling makes you feel better though and that in itself can aid recovery and relaxation. Do you have to eat 800-1200 calories a day in order to lose weight? Fight Back With Self Improvement. It's All You Have. 50 quick-fire steps to fitness in 2016! Straight Talking Fitness Foam Rolling: Yes? No? How? Why?